Mesothelioma specialists, patients, caregivers and advocates from around the country are gathering in Alexandria, Virginia, this week to exchange ideas, ask questions and raise awareness at the 11th annual International Symposium on Malignant Mesothelioma. Patients and caregivers have an opportunity to hear from mesothelioma medical specialists on a variety of topics, including post-surgery recovery, immunotherapy, radiation oncology, novel chemotherapy treatments, pulmonary health, cancer stem cells, chemo brain, the state of research and comprehensive cancer program development. There also will be sessions on raising awareness, how to host a fundraising event and how to empower patients, plus a national legislative update. Several advocacy groups are pushing for a U.S. ban on asbestos. Mesothelioma is a cancer caused almost exclusively by exposure to asbestos. That is a reason the symposium sets up an annual trip to Capitol Hill to meet with Congressional representatives who help determine federal funding priorities for all diseases. The three-day symposium runs Wednesday through Friday at the Hilton Alexandria Mark Center. Dr. Michele Carbone, director of the University of Hawaii Cancer Center. New to the annual event is a Mesothelioma Scientific Seminar, which is designed exclusively for medical professionals and scientists. Dr. Robert Kratzke, from the University of Minnesota Cancer Center, will speak about the measles virus. Dr. Lee Krug, director of the Mesothelioma Program at Memorial Sloan-Kettering Cancer Center, will talk about Tremelimumab, a drug being tested for patients with unresectable disease. Dr. Daniel Sterman, from the Abramson Cancer Center in Philadelphia, will discuss the latest developments related to the cancer drug CRS-207. Dr. Raffit Hassan, at the National Cancer Institute, will provide an update on the SS1P vaccine. Most medical professionals agree immunotherapy drugs are the best hope for controlling mesothelioma and turning it into a manageable disease in the future. The drugs work by unlocking or unmasking the mesothelioma cells, allowing the body’s own immune system to destroy them without harming healthy cells. Side effects are minimal compared with the more toxic chemotherapy drugs. Dr. Surgeon Richard Alexander, from the University of Maryland Medical Center, and Dr. Krug co-chair the seminar. Although the seminar is reserved only for medical professionals and scientists, those attending the seminar will be available throughout the symposium to anyone in attendance. 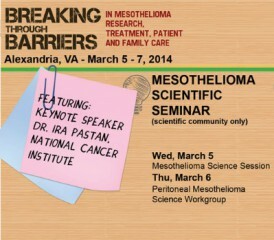 There will be several sessions devoted to peritoneal mesothelioma, which is less common than pleural mesothelioma. It involves the lining around the abdominal organs and the abdominal cavity. Among those speaking will be Dr. Paul Sugarbaker, Washington Cancer Institute; Dr. Robert Taub, Columbia; Dr. David Bartlett, University of Pittsburgh and Dr. Laura Lambert, University of Massachusetts.